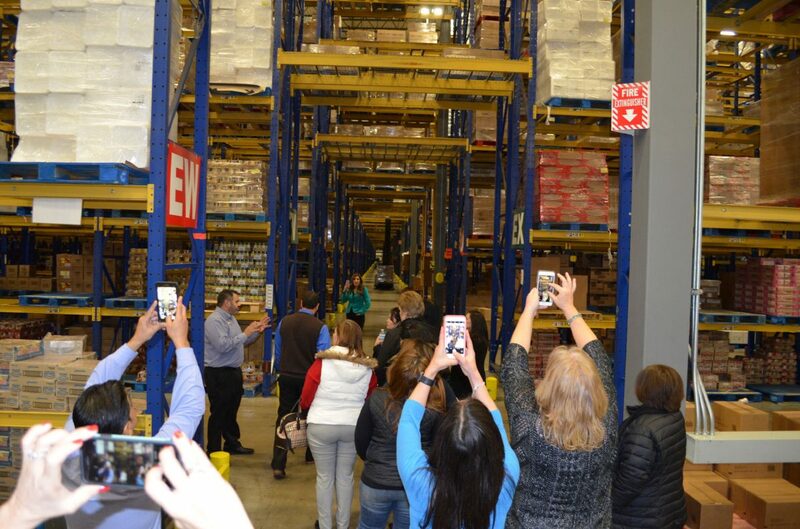 Weslaco school district counselors tour the H-E-B Distribution Center on Thursday, Jan. 18, 2017, as part of an educational tour organized by the Weslaco Economic Development Corporation. WESLACO — A group of about 20 high school counselors took on the role of students Thursday and joined the Weslaco Economic Development Corporation in a tour of local businesses to learn more about skills needs of the local employers. Valdez led the team of Weslaco school district counselors in visits to the H-E-B Distribution Center, ColiMex Cold Storage Facility and Maverick Industrial Laundry Services, where they spoke to owners, sales representatives and managers about the overall business and what type of skilled labor they employ. The counselors can then use the information to better prepare students to transition into the workforce. This is the first of many tours that the EDC plans to conduct, he said, as they pilot the initiative and grow it according to feedback and interest from both industry and counselors. For Rick Cortez, of Weslaco, this was an opportunity to show counselors how the business he and his brother Jay Cortez started 19 years ago has been evolving as far as workforce. The two own Maverick Industrial Laundry Services, which mainly contracts with hospitals across the Rio Grande Valley for laundry and dry cleaning services, washing, folding and processing about 40,000 pounds of linens per day. Like many other businesses, Rick Cortez said theirs has been evolving over the years adding more computerized systems and other tracking technology that helps them sort the orders. Handling paper invoices or orders has been a thing of the past for a while now, he said, as all of their drivers now rely on a phone application when picking up and delivering orders. At Colimex, there was also a wide array of positions that could turn into careers, said sales representative Erika Anguiano — from truck drivers, to sales and warehouse workers. The company mainly focuses on receiving and delivering produce from México, primarily to the food service industry. In Texas, in order to graduate every student must now choose a career plan as they enter high school. Counselors help guide students in the selection process, whether they plan to go to college or not. The endorsements, or paths, include business and industry; arts and humanities; multidisciplinary studies; public services and STEM – Science, Technology, Engineering and Mathematics. After this initial visit, Valdez and Weslaco EDC Executive Director Marie McDermott will seek feedback from counselors to put together a wider plan of action and reach out to other companies in the region, and plan to include neighboring cities that don’t have their own EDC. For now, the fact that the Weslaco school district had initially committed to taking 15 counselors but ended up with a group of 20, could be a good sign.